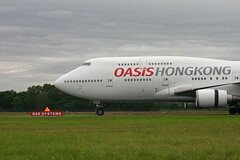 You know it really wasn’t all that long ago that Oasis Airlines started offering great fares ferrying people back and forth between Vancouver and Hong Kong. In fact it caused much hoopla with it’s inaugural promotion of free flights. It also wasn’t that long ago that Jetsgo our local discount airline went belly up. Now due to rising fuel costs, this discount airline to Hong Kong has also suddenly stopped service. Stranding many and leaving many with useless tickets. I got caught up in that whole Jetsgo issue and luckily had paid for my ticket with my credit card where I was reimbursed. Hopefully the card companies will be equally accommodating to anyone who got stuck this time around with fares paid for with Oasis. Cathay apparently will be increasing their flights to help pick up the slack as will Air Canada. More details are on the Oasis Site here. Well Oasis was running a pretty risky line and any bumps in the regular travelling patterns were going to throw them off. Which is exactly what happened, and with such expensive operations, it was very fragile. Maybe if they had done what other low-costs airlines did: fly financially-reliable routes within a small area, they would’ve survived. In the end it was just not a feasible business model.